Having garages in both Purley and Warlingham means we are perfectly placed to provide an MOT test to customers in the surrounding areas, such as; Selhurst, Croydon, Warlingham, Sanderstead and Whyteleafe. If you would like to hear more about our services, call us today on 01883 622 069 or fill out our simple contact form. We can provide an MOT for a wide range of vehicles, including specialist Class 4 and 7 vehicles. Alongside this, we offer; servicing, engine diagnostics, auto electrics and a full range of automotive repairs. The advantage of choosing to book your MOT test at Ken’s Autos, rather than a dedicated test centre, is that we can carry out any necessary repair work on site to ensure you pass and your vehicle is safe. We’re a local MOT centre with over 40 years experience and a well-deserved reputation for providing a reliable service you can trust. Having established the Ken’s Autos brand over a period of over 40 years, we have collated a community of trusted customers in Selhurst, Croydon, Warlingham, Sanderstead and Whyteleafe. What’s more, we take great pride in choosing to offer the best advice and service, as opposed to taking on every job - regardless of what is best for the customer. You can read more about what our customers think from the testimonials on our homepage. Should the worst happen, and your vehicle receives a fail for a major reason, we can repair your car quickly and efficiently, and provide a free courtesy car for your use while your vehicle is out of action. If you would like to book an MOT test with Ken’s Autos - and you are located in Selhurst, Croydon, Warlingham, Sanderstead or Whyteleafe - call us today on 01883 622 069 or fill out our online contact form. 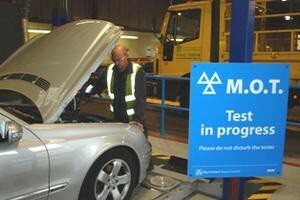 You can also book your MOT online here.